In freshwater tanks, these are mainly represented by several species of shrimps, although it is occasionally possible to find a tropical crawfish, and even small crabs. As crustaceans' carapaces mainly consist of calcium carbonate (CaCO3), it is advisable to keep them in hard water, and some crabs can even live in brackish water. Carnivorous fish are obviously out of the question as roommates. Small species of fish are not normally at risk from crustaceans, but a weakened or sick fish may be captured and devoured. Crustaceans' role in the wild as environmental regulators can be reproduced in captivity. 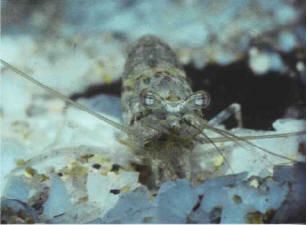 Shrimps from the Macrobrachium genus are becoming increasingly common in freshwater aquariums. Whatever species you may choose, all crustaceans feel more at home if they are provided with shelters, especially during the molt. If they are fed properly, this process will occur regularly, but the animal is vulnerable while it is forming a new carapace. It is during this critical period in their lifecycle that crustaceans usually attack each other. НАВАШИН Сергей Гаврилович (1857-1930) , цитолог и эмбриолог растений, основатель научной школы, академик АН СССР (1925; академик РАН с 1918) и АН Украины (1924). Открыл двойное оплодотворение (1898) у покрытосеменных растений. Заложил основы морфологии хромосом и кариосистематики.